I am not quite sure about you, but the idea of a Tampon Flask certainly does not sound too appealing if you were to drink a beverage from there. It would be pretty much akin to taking a swig of hot chocolate from a mug that has been shaped to resemble that of a toilet bowl, to a certain extent, that is. 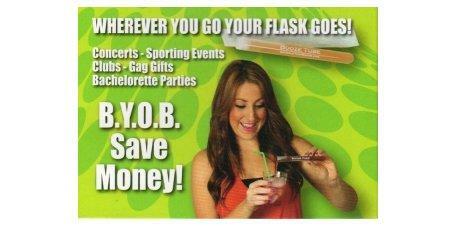 Well, the $12.95 Tampon Flask intends to bring a new look to the average flash, and it would also make for a decent place for you to hide away your booze so that no one else will look for it whenever you want to sneak it into a club or office. Guys who use it might be looked upon in a strange manner though, so you have been warned!